I ran across this interesting article while working on a news post for my job earlier today and thought it was worth sharing. It’s a piece by Australian theologian Joel Hodge on the religious and moral themes of the Star Wars saga and how they both reflect and subvert Christian theology (with some influence from Buddhism). After giving the whole thing a read through I don’t agree with the author on everything but I think they some very cogent points. While “Star Wars” emphasizes moral responsibility by choosing between good and evil, Luke’s faith goes beyond categorizing people by their choices to something deeper – something that can only be seen in the light of love and forgiveness. Luke holds onto this madness and folly – as St. Paul called Christian faith in the love of the crucified Christ – even to the point of risking his life to spare Vader, and is eventually vindicated. 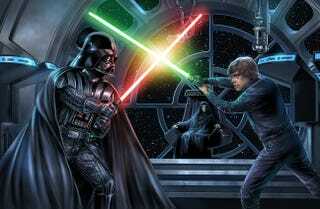 It is Vader’s conversion prompted by Luke’s faith and impending death that leads to Vader’s rejection of evil (throwing the Emperor away to save Luke) and to the breakdown of the Empire’s efforts in battle. Vader’s journey, then, moves beyond the good-evil binary – not by goodness violently suppressing evil, but a person realizing his true self in converting from evil into goodness (which has a distinctively biblical resonance). The redemption of Vader is, to a certain extent, a point of controversy within the Star Wars fandom especially given the revelations in the Prequels about some of the atrocities he committed (including the wholesale slaughter of children in Revenge of the Sith). Many argue, some quite persuasively, that it unfairly absolves Vader of any wrongdoing simply because he chose to save his son, a choice many feel seems relatively unimpressive as a moral act of redemption. But to me Vader’s redemption and Luke’s rejection of vengeance (despite the encouragement of his mentors Obi-Wan and Yoda) in the favor of forgiveness are part of what make the Star Wars saga so meaningful and more than just the space adventure fantasy it could easily have been; it gives the series a moral core that is conspicuously missing from many of the franchise’s imitations. It also is part of why I personally like Return of the Jedi more than any other Star Wars film besides The Empire Strikes Back (and I waver even on that). Vader’s act of self-sacrifice may or may not wholly redeem him (I personally don’t think it does) but it is selfless and does represent the triumph of love and selflessness over evil. Even more important I think is Luke’s choice to reject retributive violence in favor of forgiveness and love, which is not an easy one to make, especially when the person you’re forgiving has caused you personal anguish (as is very much the case in regards to Luke and Vader). What do you think though? Does Star Wars play with religious and moral themes in a significant and meaningful way or is it all just reading too much into what’s essentially a rehash of old film serials and pulp science fiction? Do you hope these ideas carry on into the new trilogy or would you rather they abandon them after the much maligned “chosen one” arc of the prequels? What do you think of the article itself? Share away. EDIT: Top link now fixed. I don’t know why it wasn’t working earlier (I thought I double checked it to make sure it coded properly) but it should work fine now. Sorry for the inconvenience.